Nigeria is set to add the most planned refining capacity among all countries in the Middle East and Africa during the forecast period, according to data and analytics company, GlobalData. 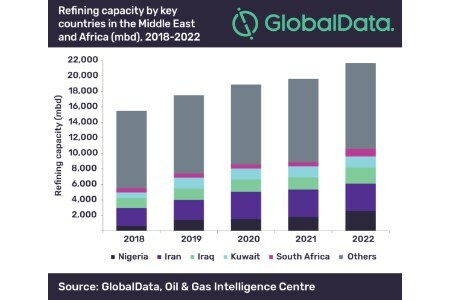 GlobalData's report, 'Refining Industry Outlook in Middle East and Africa to 2022' states that in 2018, the Middle East and Africa will account for 42.6% of the total global refining capacity. The total refining capacity in the region is expected to increase from 15.5 million bpd in 2018 to 21.7 million bpd in 2022. The region is also expected to have an estimated new build capital expenditure (CAPEX) spending of US$215.3 billion, of which roughly 25% will be spent by Nigeria during the outlook period. Nigeria will lead in terms of refining capacity additions and new build CAPEX spending by 2022. The country has planned investment of around US$54.8 billion for refining capacity additions of 1.933 million bpd by 2022. The country’s oil refining capacity is expected to increase from 446 000 bpd in 2017 to 2.572 million bpd in 2022 at an average annual growth rate (AAGR) of 35%. GlobalData identifies Iran as the second highest in the Middle East and Africa in terms of refining capacity additions. The country will add around 1.232 million bpd of refining capacity by 2022, which will increase the country’s total refining capacity to 3 545 million bpd. A planned investment of US$15.9 billion is expected to be spent on the new build projects during the outlook period. Iraq is the third highest contributor to the refinery capacity growth in the Middle East and Africa. The country’s refining capacity will increase by 780 000 bpd, from 1.296 million bpd in 2018 to 2.076 million bpd in 2022. Iran is also the second highest CAPEX spender in the Middle East and Africa with an estimated CAPEX spending of US$37.9 billion for refining capacity additions. Among the upcoming refineries in the region, Lagos I in Nigeria has the highest refining capacity of 650 000 bpd in 2022. Al-Zour in Kuwait and Siraf in Iran follow with capacities of 615 000 bpd and 480 000 bpd respectively. In terms of CAPEX, Yanbu IV in Saudi Arabia leads with CAPEX of US$15 billion during the period 2018 to 2022, followed by Tabi in Angola and Mthombo in South Africa with CAPEX of US$10.5 billion and US$10 billion, respectively.